In the late 1970s, famous copywriter Joe Karbo rocked the direct marketing world with his full-page newspaper ads. The headline was: “The Lazy Man’s Way To Riches.” Many people thought this was revolutionary. But actually, he wasn’t onto a new concept. You see, people had already been appealing to prospects’ laziness for decades. So, it’s a time-tested technique. But can you use laziness headlines yourself? Absolutely! 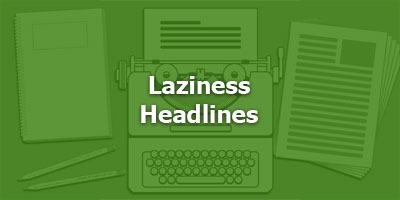 Even If your prospects are the hardest-working people on planet Earth, they’ll be more inclined to order your product when you use a laziness headline in the right way. We’ve got a lot to cover so you’ll really understand this and know how to do it. And we’ll have some fun along the way. OK. Now that we have that out of the way and my lawyer can go off and invent other things to do for me, let’s dig into laziness headlines. • How laziness is just part of human nature (even though many people go to great lengths to hide their laziness from you). - everything has an easy part and a hard part. Start by emphasizing the easy part. - human brain. Frontal cerebral cortex – ego – “hard work.” Brain stem – old mammalian brain – busy enough keeping you alive and running your emotions – they like simple, easy. And they decide what you buy. -Just because someone works hard at one thing doesn’t mean they want to, or even are willing to, work hard at everything. - Look at how many advances have been commercial advances. No-iron shirts. I don’t know much about women’s clothes, but I imagine no-iron blouses, too. Automatic dishwasher. How much easier is it to use an iPad than a vintage 1995 Windows computer? Progress favors laziness. - People are so busy these days. Who wants to add one more difficult, time-consuming activity to their schedule? ◆ (3,4)Increase pleasure, reduce pain – Hard work, no fun; pleasure is fun. Hard work – pain. Less pain = less hard work. > When you do the work necessary to make it easy for them to read and understand, they read easy, and you get paid. When you’re the one looking out for them (and their time, and their energy, and their peace of mind) – and you show it – you are much, much more likely to get the order.